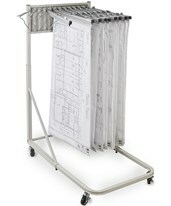 Blueprint plan racks, also known as mobile document stands or file centers, provide a convenient way to access and store your blueprints, maps, artwork, and other large-format documents. 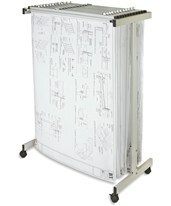 Put your large-size files in a mobile file center for easy transport around your office. 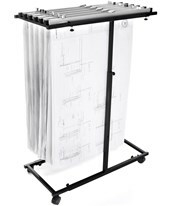 Mobile document stands feature four sturdy wheels, well-suited to moving your large-size documents from room to room, while keeping them organized and neatly stored. 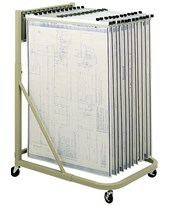 Some types of mobile document stand feature vertical hanging storage of your blueprints and maps. Just attach your large-format files to hanging plan clamps, and this kind of file center will keep them smooth and neat, while making efficient use of space. 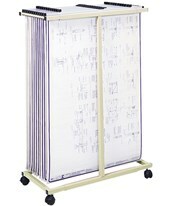 Some of these mobile plan racks have swinging arms that hold your clamps and documents, while some of these file centers feature a fixed bracket where you can drop in or lift out your plan clamps and large files, but all are lightweights and portable to hold hundreds of blueprints, maps and more. Don’t need you files to stay flat? You can roll them up and store them in an upright roll file. This kind of mobile file center allows you to just roll up your blueprints or drawings and store each one in its own easy-to-access compartment, provide a handy, portable, and economical way to store your works-in-progress. Simply roll up your blueprint or plan drawing and stow it away in one of the cubbyholes provided. You can move your blueprint plan rack from room to room, so your files are always available where you want them. If you need more secure storage or won’t be accessing your plans as often, mobile file center with drawers provides a secure and dust-free method of storing your large documents. You can lock away sensitive files, and keep everything clean and organized in the large storage drawers, while still enjoying the convenience of portable document storage with the attached wheels. 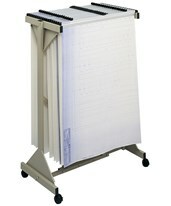 Whatever your requirements, Tiger Supplies has a mobile document stand, blueprint rack, or file center for you! Such well-known manufacturers as Mayline, Safco, and Adir provide blueprint plan racks in a variety of styles and colors, all made of durable, long lasting materials, assuring long-term use of your mobile plan rack.